If there is an iota of truth in these rumours, internet users across the country will be in for a huge treat as the major players offering services fight it out to capture the markets. Mukesh Ambani owned Reliance JIO Infocomm got the Broadband and Wireless Access (BWA) spectrum license (through Infotel acquisition) for launching mobile internet services in the country couple of years back but the company has since been tight lipped about the date of launch of its much hyped ultra affordable high speed internet services, the speed at which it will be offered, the tariff plans, etc. which has made the rumour mongers more active than they usually are. Given the buzz, it is expected that Reliance JIO services will be starting as early as this month. A preview website (), which was live for sometime before being taken down by the company (cached version here), suggested that users might be able to surf the internet at unbelievable high speeds of upto 100Mbps, and that too without having to pay through their nose. The recharge plans might cost as less as Re. 1. Folks over at TelecomTalk were able to grab a screenshot of the website which displays some unbelievable pricing for ultra-high speed internet. We, as consumers, will certainly love it. Sounds too good to be believed? The ‘FTTH FIP Alpha Offer’ plan is said to offer Fibre to the Home (FTTH) connection at a speed of 100Mbps and a usage quota of 100GB with free On-Net usage discount. The plan will have a one month validity period and the package box will include the Router Gateway, Router Drop Cable, Wi-Fi, and Ethernet. The ‘FTTH FIP Alpha Offer along with Wi-Fi and JioDrive’ plan is said to offer FTTH connection with a speed of 100Mbps with a usage quota of 100GB and free On-Net usage discount. This plan will also have a one month validity period. Same as FIP Alpha? NO! This plan also offers 100GB of cloud storage for one year. It might also come with a Wi-Fi Hotspot device, which will offer high-speed Internet connectivity in various cities. The ‘Volte Basic’ with First Recharge (FRC) will offer unlimited voice along with Rs. 1,099 plan which will offer Sports Channel pack of 50 Channels. A Rs. 51 Jio Wi-Fi subscription plan which will provide 1GB of data through Wi-Fi. 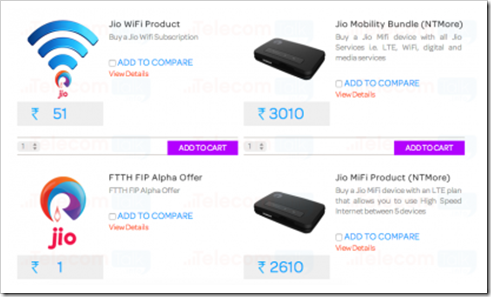 This plan offers Jio MiFi device with all Reliance Jio Services i.e. LTE, Wi-Fi, digital and media services. A Rs. 500 plan for this device will offer 10GB of data. It also comes with a VoLTE SIM card. This Jio MiFi device will offer internet connectivity to five devices at once through Wi-Fi. A Rs. 100 Jio MiFi Start-up Plan will offer 1 GB data along with Digital services. Reliance JIO services offering are definitely round the corner and here is another pointer to that. 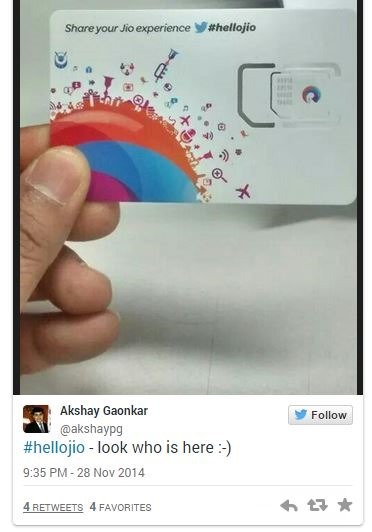 A twitter user Akshay Gaonkar was able to snap this photo of Reliance JIO Sim card in the wild. There is no doubt that all major telecom operators in the country are fighting for establishing their supremacy over the rapidly growing internet market. Airtel has already slashed its 4G data plans hugely and made it cheaper than its own 3G services last week, but considering the extremely low prices for which Reliance might make its services available, consumer loyalty might take a backseat. For now, it is wait and watch. And perhaps wish that these rumours do turn out to be true!! "Reliance JIO’s Preview Site Suggests Internet at 100 Mbps, Recharges As Low As Re 1", 5 out of 5 based on 1 ratings. Can you suggest me the packages from JIO-Relience for 15days to full fill our WIFI requirment inhi-speed,yet the baby router with us,within Kolkata-Mumbai please? The sim cards are already distributed to reliance jio employees and the sellers in every area who will will sell their products including LYF smartphones. The mobile store owner in our locality said that he is using it and it is blazing fast. We would like reliance distribution ship of Noida , Ghaziabad. Realiance 4G best fast interent 3GB 30days BEAUTIFULY WI-IF different with mobile , computer favorite sweet tell now. Unfortunately,Reliance works on the principle of -“Karlo Duniya Mutthi me”, Grab the world in your fists,and its not for customers,but for the reliance people. These plans may be true but when we will buy, the call meter will be running chaotically randomly deducting extra cuts for itself-a trick every indian company has perfected. Already the TRAI would be slumbering somewhere Drugged by these giants along with its partner Mr BSNL,paid to be inefficient…..